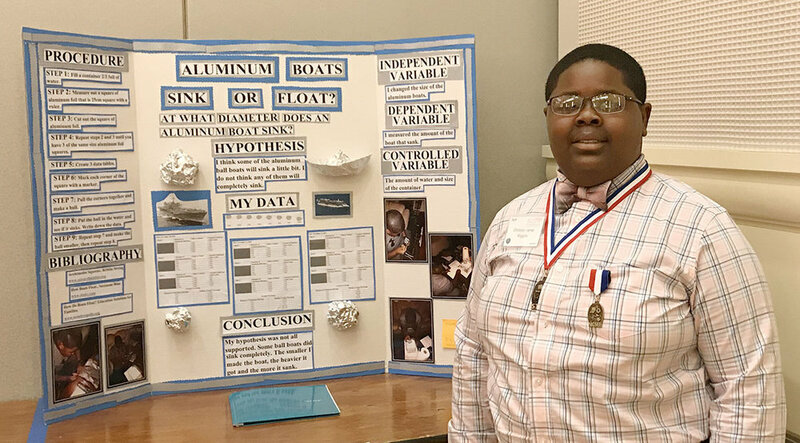 Two Lenoir County Public Schools students came home from the North Carolina Science and Engineering Fair with awards and one of them won the chance to take his science fair project to national competition in Washington, D.C., next October. Austin Williams, a seventh grader at Frink Middle School in La Grange, won second place for his project “Sound Check,” which tested which materials provided the most effective sound proofing and how the size of a room affected the sound level. He competed in the middle school Engineering and Technology category. His result in the state contest, held last weekend at the campus of N.C. State, includes a nomination to compete in the Broadcom Masters, the nation’s top science and engineering competition for middle school students. Northwest Elementary School fifth grader Christian Wiggins received an honorable mention in the elementary school division. His project — “Aluminum Boat: Sink or Float?” — explored how shape and size affected the buoyancy of “boats” he fashioned from aluminum foil. Austin, Christian and eight other LCPS students qualified for the state science fair by winning honors at the Northeast Region Science and Engineering Fair held in February in Greenville. About 400 elementary, middle school and high school students from across North Carolina competed at the state level. Along with his award, Christian returned from Raleigh with an enhanced appreciation of N.C. State and its engineering program, according to his teacher, Shalona Newkirk.